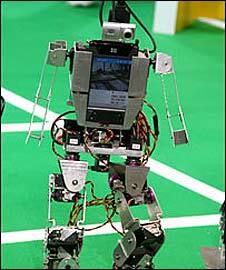 A tiny football-playing robot has been developed by a team in Zurich to spark young people's interest in nanotechnology - and with the hope of leading to pioneering medical treatments. The robot, made out of nickel and powered by magnetic fields, is just 300 microns wide - about the width of three hairs. It plays football with an even smaller ball, dubbed a "nanoball" - and is able to dodge microscopic "defenders" before slotting home into the world's smallest goal. The robot's developers at the Swiss Federal Institute of Technology in Zurich told BBC World Service's Digital Planet programme that the project is about engaging young Swiss - whose country will co-host the football European Championships this summer - in tiny tech. "It's hopefully the start of a long-term competition in trying to make nanotechnology and microtechnology that can get kids excited in the classroom about this stuff," said professor Bradley Nelson. Seen by the naked eye, the robot looks like a very small speck of dust. Controlling it involves watching through a camera, which tracks the robot through a microscope. The robot can either be controlled manually by the cursor keys on a keyboard or programmed in advance. "Hit a button and it goes," said professor Nelson. "It figures out where the obstacles are, and it can then pick up a ball and move it into a goal. "It's really fun to watch. It gets the students involved - we take it to the kids in Zurich and get them interested in nanotechnology." The team was inspired by the success of the Robocup project, in which autonomous robots play football against each other, with the aim of building a robotic team capable of challenging a World Cup-winning human side by 2050. "They're amazing to watch," said professor Nelson. "It's a fun competition, but trying to move it down to these scales is a challenge, but something that opens up a whole new area of technology to the students." 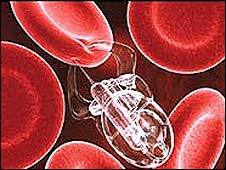 But the ultimate real-life application of the tiny robots is medical - moving small particles within the human body. The hopes are that tiny robots will help with things like delivering drugs through hard-to-reach or otherwise risky areas. For example, nanobots may be able to navigate drugs through the veins in the retina, the inner layer of the eye. "We're looking at novel ways of delivering drugs to locations of the body that are very difficult to reach," professor Nelson said. "This is a step on that road."